Or, get it for 203200 Kobo Super Points! Offered in print, online, and downloadable formats, this updated edition of Stroke: Pathophysiology, Diagnosis, and Management deliversconvenient access to the latest research findings and management approaches for cerebrovascular disease. Picking up from where J. P. Mohr and colleagues left off, a new team of editors - Drs. 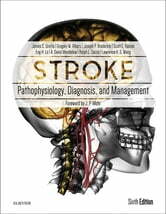 Grotta, Albers, Broderick, Kasner, Lo, Mendelow, Sacco, and Wong - head the sixth edition of this classic text, which is authored by the world’s foremost stroke experts. Comprehensive coverage of advances in molecular biology of cell death; risk factors and prevention; advances in diagnostics and stroke imaging; and therapeutic options, including a thorough review of thrombolytic agents and emerging data for endovascular therapy. Brand-new chapters on Intracellular Signaling: Mediators and Protective Responses; The Neurovascular Unit and Responses to Ischemia; Mechanisms of Cerebral Hemorrhage; Stroke Related to Surgery and Other Procedures; Cryptogenic Stroke; and Interventions to Improve Recovery after Stroke. New information on genetic risk factors; primary prevention of stroke; infectious diseases and stroke; recovery interventions such as robotics, brain stimulation, and telerehabilitation; and trial design. Advances in diagnostic tests, such as ultrasound, computed tomography (including CT angiography and CT perfusion), MRI (including MR perfusion techniques), and angiography. Extracted and highlighted evidence levels.